MacBooks... Are They Worth It? After getting quite a few questions, I thought that I would do a post all about my Apple MacBook. If you have ever visited my blog or seen my Instagram before, I am sure that you guys will have seen my MacBook featured in some of my images before and that is purely for the fact that I use it all of the time and it is absolutely stunning. But, the more I feature my very expensive MacBook, the more questions that I get about it, so I thought that it was finally time to answer some questions and let you guys know if I think that it is worth it or not in one long blog post. I decided to go ahead and buy this MacBook purely, so I could work on my blog when I am out and about. As some of you guys will know, I work full time and I manage my blog in my spare time, so I wanted something that would allow me to work whenever I want. Since my grandad passed away in 2017, I now spend hell of a lot of time with my nan and I wouldn’t change that for the world. But some days, when I am particularly snowed under with work, I needed something that I could work on without me having to lug around my big and heavy laptop. Before I went into the Apple shop to pick up my MacBook, I made sure that I did hell of a lot of research into it online before spending that much money. I have always had laptops and computers, so I knew that I was looking for and what I needed from a MacBook. I decided to opt for the classic MacBook and not the Air or the Pro because it just suited me so much more. The processors are more advanced than the Air and much more lightweight and portable in comparison to the Pro. I think one piece of advice that I would give you is really clue yourself up before going into store or they will pounce on you like you are a defenceless Giselle! I have owned this MacBook for well over a year now and I really do love it just as much as when I first bought this. I am pretty sure that at the time when I bought this MacBook it set me back around £1245, which I know is hell of a lot for essentially a lightweight laptop, but in my opinion, it is worth every single penny. There has not been a day in the past year where I haven’t picked this up at least once and that is what makes it worth it in my opinion. Plus, I have always used Apple products and I know from personal experience that they are reliable, consistent and they get the job done really well. The main reason why I love my MacBook is because I can just slip it into my handbag without any issues. This is so incredibly thin, so it just stands there without taking up any room at all. Plus, this is so lightweight, I can barely even notice that it is in my handbag. This even enables me to take it travelling with me so that I can always stay up to date and I don’t have an issue, or I don’t have to carry something heavy and bulky with me. Another thing that ties in with the portability of the scale is the fact that it has an insane battery life and I can work on this for a good 8 hours out of the house without even having to think about charging it up. In the year that I have been using this MacBook, I have noticed that it still powers up just as fast and works just as well as the first day that I brought this home. This has a brilliant memory for something as lightweight and compact as this MacBook, I can use this all day long on the internet, Microsoft programmes and with music playing and it stays lovely and quick with no lagging or crashing. I will say that I don’t keep many files on the MacBook itself because I work primarily from external hard-drives, Google Drive and on the internet, so I think this has played a big part in keeping the laptop nice and quick. Another thing that I adore about this MacBook is the keyboard itself. The keys have a butterfly kind of mechanism, which means that you only have to touch them incredibly lightly to register that the key has been pressed, this is a god send for somebody as heavy handed as me. Plus, the backlit keyboard means that on those nights where I am working away in bed, I can see what keys in am kitting. I know that the keyboard is only a very small thing, but it is something that I absolutely adore in this and why I reach for it over my traditional HP laptop. I think my only criticism of this MacBook would be that you do not get a USB port with it. As a blogger and photographer, I quite often need to plug things into my laptop like my iPhone, external hard-drive and even my camera. I get that they did it because eventually all places will move away from the traditional USB, but in my opinion, we are just not ready for that yet. I did have to go to the Apple store and buy an additional USB-C adaptor, which I can plug in and it allows me to connect up to 3 USB’s at the same time. I really don’t think that there is much more that I can say about my MacBook. It is ridiculously expensive, but I know that I would buy another in a heartbeat if I had to. This allows me to work from anywhere in the world at any given time. It is incredibly practical and lightweight, and it has quickly become an integral part of my blogging everyday routine. I couldn’t recommend this anymore and if you are out of the house as much as I am, I think that it is a vital tool. 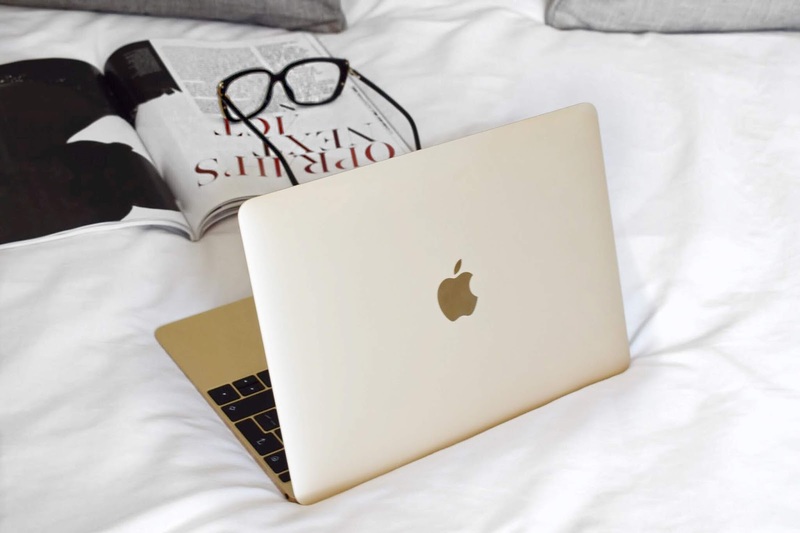 Make sure to leave me a comment down below and let me know if you have ever used a MacBook and what your take on it was! It could do, it is just the speed that is a winner for me! I think it really does depend how much time you spend on your current PC and the loading time! I love Mac computers and can't imagine going back to Windows. I bought my first MacBook Air almost ten years ago and just replaced it last year. The only reason why I finally replaced it was because I spilled some water on it, haha. I think they're definitely worth the price. I do too, amazing quality! I've changed to a Macbook around a year ago and I would never go back. They are so practical and as you say, very lightweight, allowing us to take it anywhere without being too inconvenient. The quality is just absolutely amazing! I couldn't agree more sweetie! I love my mac book! They are just amazing tools to have! They are just amazing quality and cuts down my work time so much! PERSONALLY TO ME, THIS IS JUST LIKE ANY OTHER GOOD LAPTOP. WE ALL HAVE PREFERENCES AND WE GO WITH WHAT WORKS FOR US. We do, I think it is the speed more than anything else that helps me! I am with you on the HP front! They really are worth the money in my opinion! I loved my HP too, I still have it actually! I think that it really is all down to personal perference! Disclaimer: I'm typing this comment from my MacBook Air, so I'm definitely biased, to say the least, haha. I love MacBooks! I find that when switching from Windows to MacOS, it's a slight learning curve, but it is so much more intuitive, and SO. MUCH. FASTER. Plus, I find multi-tasking way easier on a MacBook. The speed for me really does make it all worth it! I am absolutely in love with mine, I could not be without it! I got my first MacBook Pro in 2012 and only replaced it a year ago :) my PC laptops never lasted, so definitely the right choice for me! I think it is all down to how you use it! I think this was such a useful topic. I completely agree with you. I also believe the MacBook is over priced, and sometimes I wonder if I really needed it, but I also love the aesthetic of it. I know in the future I would purchase another one even though it is so pricey. Great post, lovely! I feel like I am the exact same!